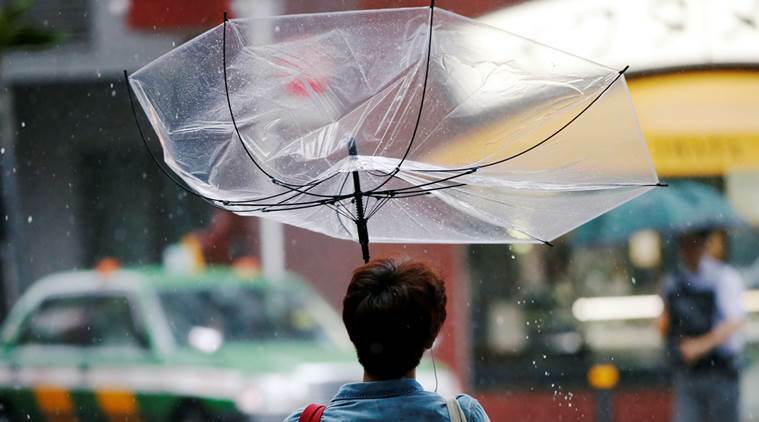 Seoul: A weakening typhoon is brushing by metropolitan Seoul after battering southern South Korea with heavy rain and high winds, leaving one person missing and a slew of damaged buildings, cancelled flights and power outages. Japan’s weather agency downgraded a separate storm from typhoon strength on Friday after it crossed a swath of the western part of the country overnight. South Korea’s weather agency said typhoon Soulik’s force has diminished as it moved northeast but was still expected to pound the country’s mountainous eastern region with strong rain and winds before exiting the peninsula in the afternoon. Rain from Soulik also fell in North Korea’s capital Pyongyang throughout the morning, but the impact appeared to be mild. Information on what preparations had been taken or if any damage had occurred in the North was not immediately available. About 22,000 power outages were reported at homes, buildings and farms in the southern regions and more than 700 flights were canceled on Thursday. No major damages have been reported in Seoul and the surrounding metropolitan area, where about half of the country’s 50 million people live. The Japan Meteorological Agency said Cimarron, now a tropical storm, was back at sea and heading for northern Japan after crossing a swath of the western part of the country overnight, bringing heavy rain and high winds. The agency said Cimarron was moving north with maximum sustained winds of 108 kilometers per hour (67 miles per hour) with gusts to 144 kph (89 mph). It was forecast to make landfall on the southern part of Hokkaido island on Friday night. The storm caused scattered damage and flooding as it swept across western Japan the previous night. More than 300 flights were cancelled and high-speed bullet train service was suspended in the region.